Social Media Today together with Hinge Marketing recently released a new research report about “Understanding employee advocacy on social media”. It’s a great read, particularly because it explores the correlation between revenue growth rate and employee advocacy adoption. 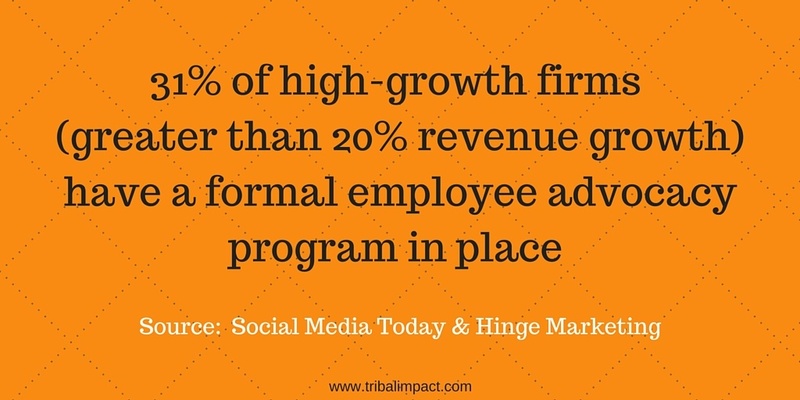 One very telling result shows nearly 31% of high growth firms (those companies that experience revenue growth of 20% and more per year) have a formal employee advocacy program in place, more than double the average of all the other firms put together! This report will also help you understand the benefits of employee advocacy for both brand and employee which is important as I will explain later. So I’ve picked out my favourite statistics and added some practical tips based on my experience. 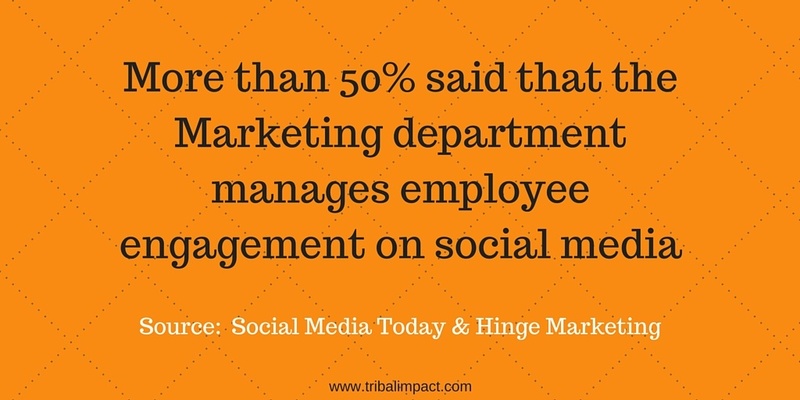 More than 50% of the sample said that the Marketing department manages employee engagement on social media while over 25% said no specific department owns it. I found this quite interesting because employee advocacy has been a hot potato for most organisations, often pursued by different departments. In my experience Employee Communications or Internal Communications have always championed the cause since they have a direct link to managing the employer brand together with HR. However, Marketing typically manages the brand social channels so already understands how to ‘talk social’. The Marketing department is also closer to revenue, directly generating pipeline in partnership with Sales. I can’t understand why more marketing professionals aren’t leading employee advocacy programs since it’s relatively easy to connect the impact of advocacy on inbound leads, website traffic, search engine optimisation performance and content marketing. Employee advocacy will only succeed when everyone is working to the same blueprint. Fractions of social media innovation across the business will only complicate everything for both brand and employees. Stand up. Lead. Bring together like minds. Build a plan. How Much Time Do Employee Advocates Spend On Social Media? 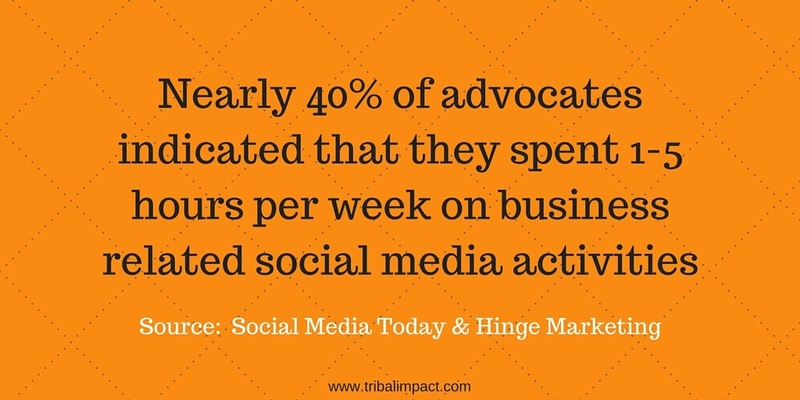 Nearly 40% of advocates indicated that they spent 1-5 hours per week on business related social media activities. However, when we look only at individuals in formal employee advocacy programs, nearly 60% spend more than 5 hours per week on average. Now here lies a tricky statistic because some leaders are of the opinion that employee time spent on social media is unproductive, hard to track and impossible to attribute directly to revenue. In our KPI obsessed world we like to track EVERYTHING (I love that post...take a look) if it can’t be tracked, it’s not adding value - right? Wrong! Trust is the big motivator when it comes to employee engagement. An engaged culture is often one that is built on trust. However, I’m not naïve and I know that numbers are still important so it’s good to know that employee advocacy tools (and there are many) now allow you to add tracking codes within the links. If you’re using a CRM system (which most businesses are) you can now start joining the dots from employee share to lead generated to pipeline created. My Tip: It’s easy to get lost on social media. It can be a time vacuum if not managed correctly, so train your employees to invest their time in the place they’ll get the most return depending on their level of social maturity. This can be done by giving them daily routines e.g. social in 30 minutes every day. Routines that get them active without spending time on non-productive activities. Training goes far beyond “Twitter 101”. It’s about enabling your workforce to become socially active over time. What's The Impact On Business Performance? 31% of high-growth firms (greater than 20% revenue growth) have a formal employee advocacy program in place (more than double the percentage of all other firms) and 27% of those reported shortened sales cycles. You may have heard of the phrase “social selling”? At SAP I always supported social advocacy across the entire business. Sure, Sales would need a slightly different approach to the social training provided to marketing or to HR but the social advocacy strategy was the same throughout the business. After all, the entire organisation now has the power to influence a sale! Well, that’s basically employee advocacy but with a focus on sales related activities with specialist training around networking, prospecting and engaging for relationship building. The sales department is the place where you’ll probably yield the fastest employee advocacy benefits. In my experience I’ve seen strong correlations between active social sellers and consistent quota achievers. LinkedIn research also shares the same experience. 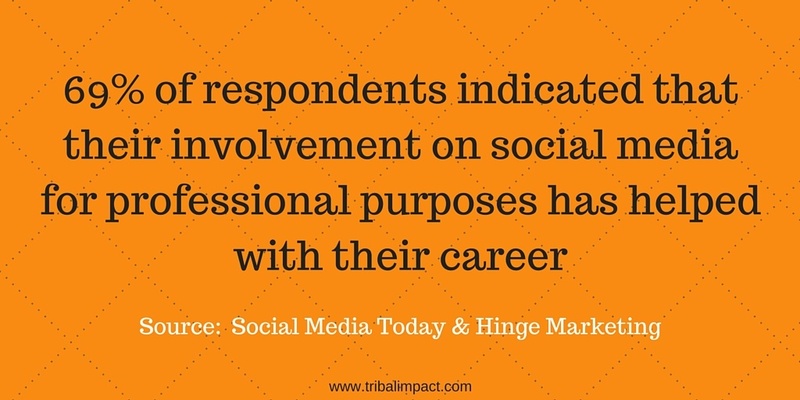 69% of respondents indicated that their involvement on social media for professional purposes has helped with their career with 87% saying it helped expand their professional network and 76% saying it helped them keep up with industry trends. The great thing about employee advocacy (and the reason I’m so passionate about it) is because it’s a meeting of minds between employer and employee. The employer invests in training for the employee to build their personal brand online. That investment in itself fuels employee engagement and is a wonderful by-product of the bigger organisational impact. Employees are more trusted as sources of content when B2B buyers are researching online. My Tip: Start advocacy programs within the sales department and then move out to the wider organisation. They’re closer to the customer and the results can often be directly attributed to revenue – a language that the board will understand. Once you see results here (and you will…believe me) you can build the case for expansion so the program supports the entire customer experience…not just the sales one. Then you’re stepping into content creation, thought leadership, amplification etc. The whole eco-system starts to knit together. 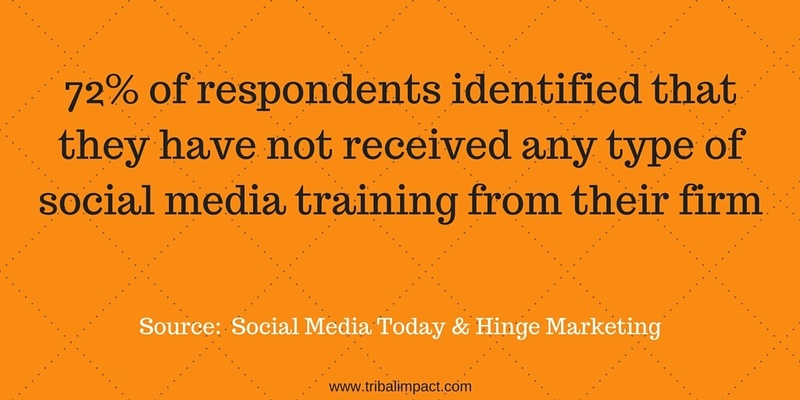 72% of respondents identified that they have not received any type of social media training from their firm. Yikes – this is so high it scares me! What concerns me about this number is the fact that many employees might be activating their profiles without any consideration as to the impact on their personal brand or their employer’s brand. You don’t need marketing megaphones. You don’t want content spammers. At the very least employees should be trained around social policies and guidelines e.g. what can/can’t be said online and disclosing who they work for. We already know from earlier that there is a correlation between firms with formal programs in place and those with high growth. It’s worth acknowledging that those with formal programs in place are recognising the need for structured training around the program. As a result 86% of respondents within a formal advocacy program said their engagement on social media had a positive impact on their career. 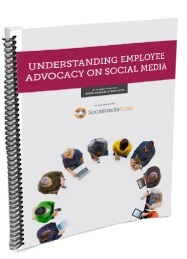 My Tip: In my experience, employee advocacy is not just about the tool. Too often tools are positioned as the answer but without the contextual training to support the tool, you will quickly find your employees happily spamming their networks with content that neither maps to their personal brand nor add value to their network. Their primary goal is geared around reaching the top of the advocacy leader board! Be careful. The tools come later. Enablement should come first. There isn’t a lot of current research out there about employee advocacy and its impact on the business so this study is quite timely and actually explores not just the benefit for the organisation but also the employee. That’s important because employee advocacy is a two way street. Invest in your employees to help them build a personal brand. In return you will build a tribe that will search, converse, connect and share content that will in turn support your bigger organisational goal – to attract customers to your business. What’s even more incredible is that you may just uncover some gems in your organisation that you never realised existed. People with enormous credibility within the industry. People with an amazing talent for writing. People with vast networks and the ability to connect. It’s all about sharing, enabling, building relationships and creating a better customer experience for all.